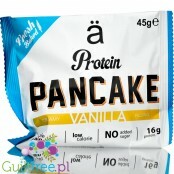 An innovative product - the first ready-to-eat protein pancake. Soft and fluffy pancake filled with vanilla custard filling. 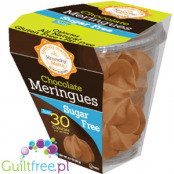 Low-calorie (less than 150kcal) sweet snack provides 16g of protein and less than 3g of sugar. 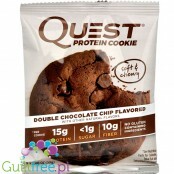 The latest deliciousness in the Quest protein family - a delicate, soft chocolate cookie with chocolate pieces provides as much as 15g of protein and 10g of fiber. 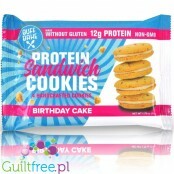 Gluten-free Quest protein cookies are sweetened only with stevia and erytrol - they do not contain sucralose, maltitol or any added sugar. 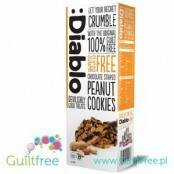 Rich in protein, with ultra-low content of active carbs (less than 2g of sugar), gluten-free, trans fat-free and with no sugar added - delightfull cookies created in a small New Zealand factory have amazing taste, consistency and incredible nutritional values. 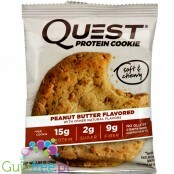 The latest deliciousness in the Quest protein family - a delicate, soft chocolate cookie with peanut butter and peanut pieces provides as much as 15g of protein and 10g of fiber. 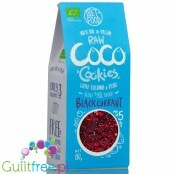 Gluten-free Quest protein cookies are sweetened only with stevia and erytrol - they do not contain sucralose, maltitol or any added sugar. 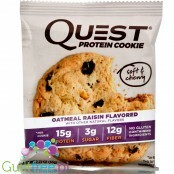 The latest deliciousness in the Quest protein family - a delicate, soft vanilla cookie with chocolate pieces provides as much as 15g of protein and 10g of fiber. 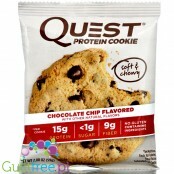 Gluten-free Quest protein cookies are sweetened only with stevia and erytrol - they do not contain sucralose, maltitol or any added sugar. 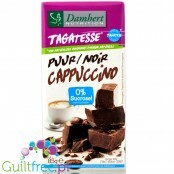 Rich chocolate-flavored chocolates, rich in fiber and mostly protein-packed and almost sugar-free - only 1.6 of praline sugar. 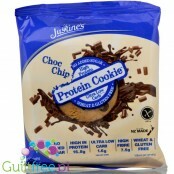 Vegan giga-ciacho protein - Complete Cookie is about 11cm in diameter and weighs almost 2 times more than the average protein bar. 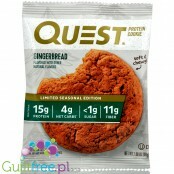 16g of protein, 6g of fiber! 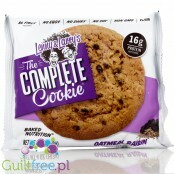 Fragile, full-bodied Oatmeal Raisin is filled with sweet raisins, delights in taste and enjoys 100% natural vegan composition. 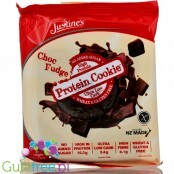 Vegan giga-ciacho protein - Complete Cookie is about 11cm in diameter and weighs almost 2 times more than the average protein bar. 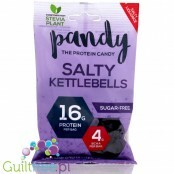 16g of protein, 6g of fiber! 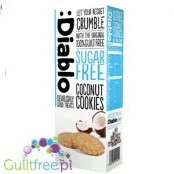 Fragile, topped with white chocolate and walnuts - Complete Cookie Snickerdoodle delights and enjoys 100% natural vegan composition. 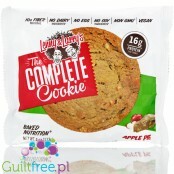 Rich in protein, with ultra-low content of active carbs (less than 2g of sugar), gluten-free, lactose-free, trans fat-free and with no sugar added - delightfull cookies stuffed with chunks of chocolate are created in a small New Zealand factory and have amazing taste, consistency and incredible nutritional values. Swedish liqueur skim milk with BCAA, sugar-free, gluten and lactose, sweetened with stevia and erythritol. 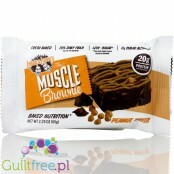 The package delivers 16g of protein and 4g of BCAA which reduces fatigue and minimizes post-workout muscle fiber damage. 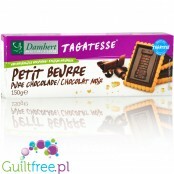 High quality pralines in milk chocolate topped with white chocolate chips, rich in fiber and first of all packed with protein and almost no sugar - only 1.2g of sugar in praline. 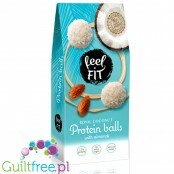 High quality pralines in white chocolate topped with coconut shreds, rich in fiber and above all packed with protein and almost sugar-free - only 1g sugar in praline. 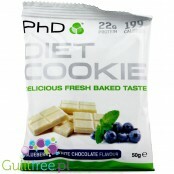 A protein cake with berries and white chocolate, low in sugar (3.5g) and high protein concentration (22g protein in 199kcal), with L-carnitine, CLA, linseed and chrome.The Diet Doc Cookies are especially suitable for dieters who consume large amounts of protein while counting calories. 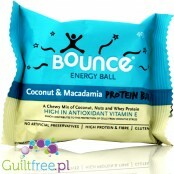 Bounce Energy Ball Coconut & Macadamia is a source of slowly released carbohydrates, high-quality protein, fiber, antioxidants and above all, phenomenal taste. 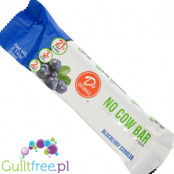 Gluten-free snack for athletes with top quality ingredients. 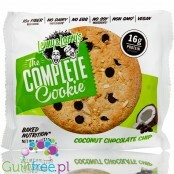 Vegan giga protein cookie - Complete Cookie is about 11cm in diameter and weighs almost 2 times more than the average protein bar. 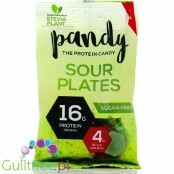 16g of protein, 5g of fiber! 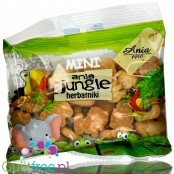 Fragile and aromatic Complete Cookie delights and enjoys 100% natural vegan composition. 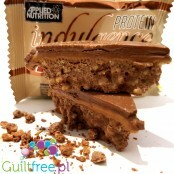 Delicate crunchy wafer with protein peanut cream - these desserts have neither sugar nor sugar! 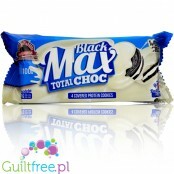 News from Novo Easy Protein - light as a cloud, whitening in the mouth, enriched with whey protein mega crunchy wafer with vanilla cream in a yogurt topping. 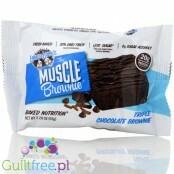 Choco Muffin is chocolate protein muffins with a high protein content - an excellent addition to the diet in the form of a healthy snack. 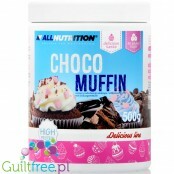 Easy and quick to prepare, Choco Muffin muffins use a blend of protein concentrate that provides a comprehensive amino acid profile. 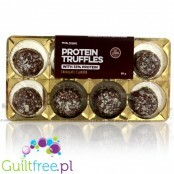 Semi-sweet pralines enriched with protein filled with nut-chocolate cream. 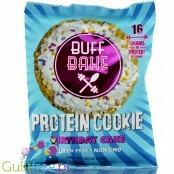 Buff Bake protein sandwich cookies - Buff Bake protein cookies stuffed with a Buff Bake cream based on Buff Bake peanut butter infused with white chocolate. 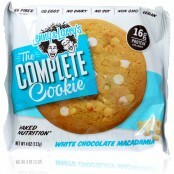 The package contains 4 double-folded cookies. 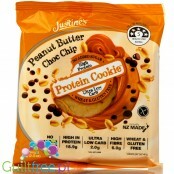 The category "protein cakes" contains protein counterparts of traditional cookies available in stores. 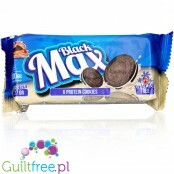 Do you miss wafers, muffins and crispy cookies? 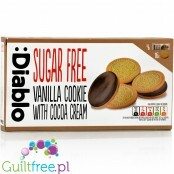 At Guitfree we have gathered their healthy counterparts. 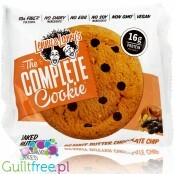 In our store you will find great protein cakes from Lenny & Larry, which will satisfy even the greatest cookie-eaters. 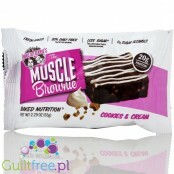 These cakes are delicious, occur in many amazing flavors and additionally ensured that their nutrients do not ruin the assumptions of your diet. 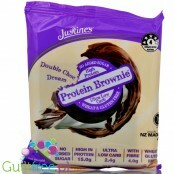 Protein cakes available in our store contain a small amount of sugar, limited amount of fat and are additionally enriched with high quality protein. Diet is a period of sacrifice and longing, often willpower is not enough and for mental health we must allow ourselves to forget for a moment. 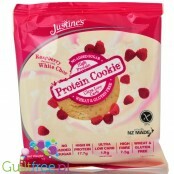 A protein wafer is a healthy alternative to traditional biscuits that will satisfy sugary desires. 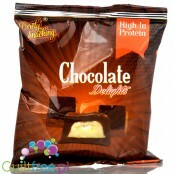 For particularly demanding customers, we have uncompromising Mighty Muffins or protein muffins from a cup.